If you are thinking of growing sunflowers this year, why not grow the biggest, tallest, most impressive sunflowers? 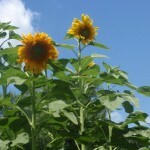 I am talking about Mongolian Giant Sunflowers. I have grown these that past two years. I like to grow tall sunflowers and these did not disappoint. Last year the Mongolian Giant Sunflowers grew to be over ten feet tall and produced seed heads that were bigger than a basketball. I have saved seeds from the largest seed head I grew this year. 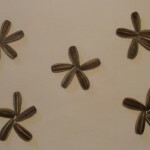 I am offering a limited number of seed packets for sale. View the product page for full details. 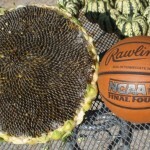 The seed head of the Mongolian Giant Sunflower is bigger than a basketball. The 2×2 pictured is 10 feet tall. 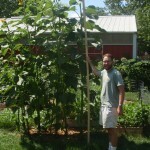 The Mongolian Giant Sunflower is taller. Mongolian Giant Sunflowers grow over ten feet tall.